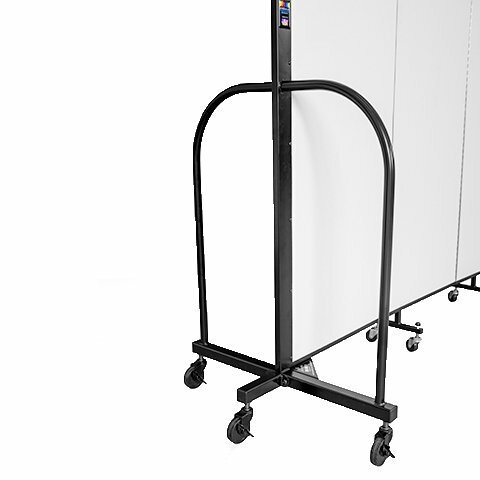 5' 8" 7' 6" 9' 4" 11' 2" 13' 0"
When floor space is at a premium, dividing areas using our “single support” FlexFit divider is a great solution. 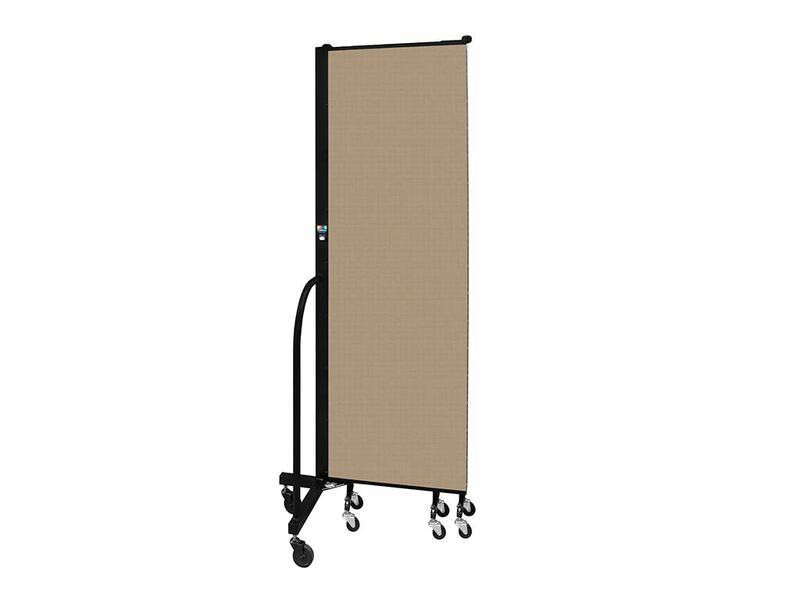 All FlexFit portable privacy screens are supported with one end frame and multiple self-leveling casters for stability and ease of use. 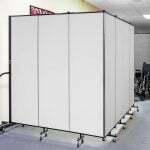 One person can easily unfold up to 13 feet of sound absorbing panels to divide any area in seconds. 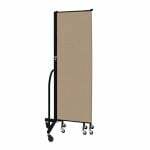 FlexFit dividers are a common choice among facility managers of medical facilities to create private areas for immunizations, meet HIPPA requirements, display notices or other items and more. 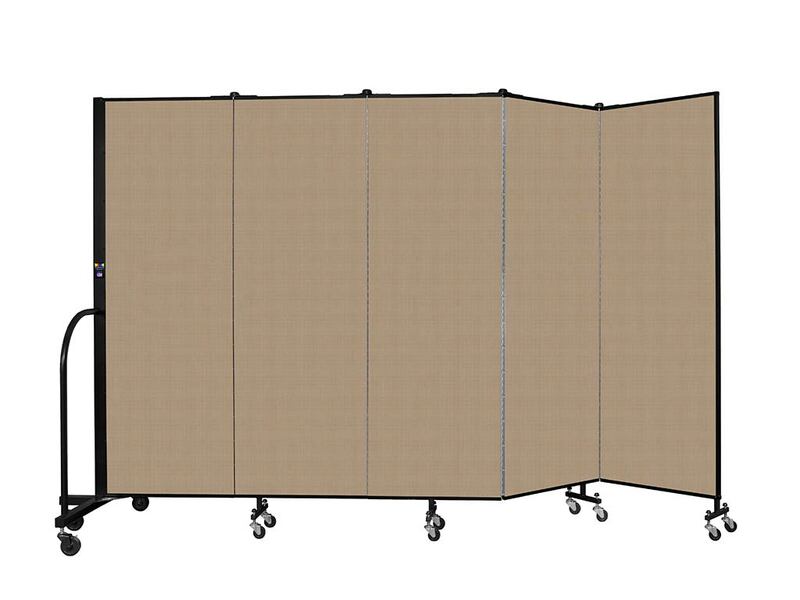 When the divider is no longer in use they can be folded back into a compact area for storage or rolled to another part of the facility for its next assignment. 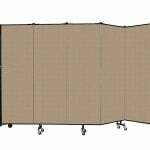 Our FlexFit dividers are made from our proprietary acoustical core and encased in tackable fabric. 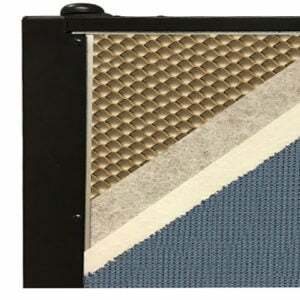 Additionally, vinyl coverings are available for those customers who want a surface which is easier to clean. 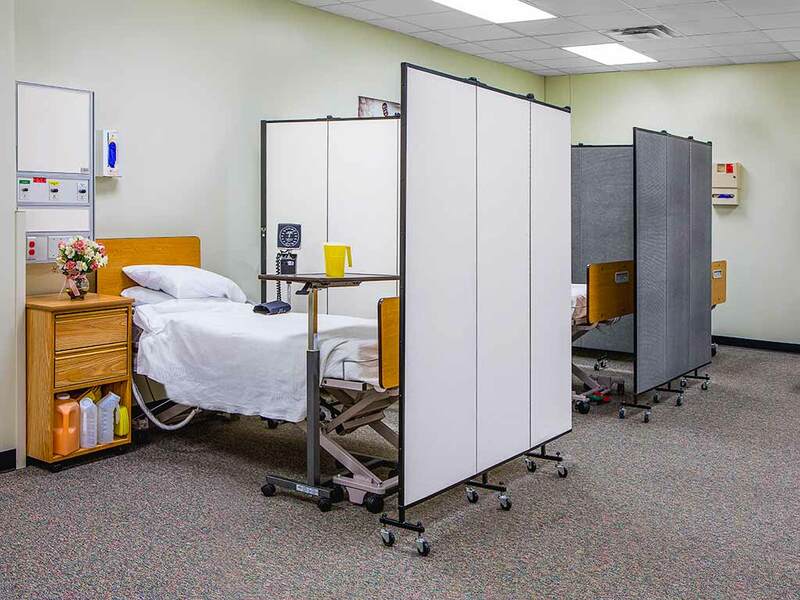 Also, fully hinged panels allow you to create a variety of shapes and angles such as straight lines, L-shapes, zig-zags, and semi-circles while still maintaining patient privacy. 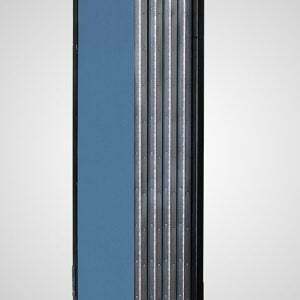 Units fit through any standard doorway and store in a small area. Easy to move, easy to use, and just as easy to store. 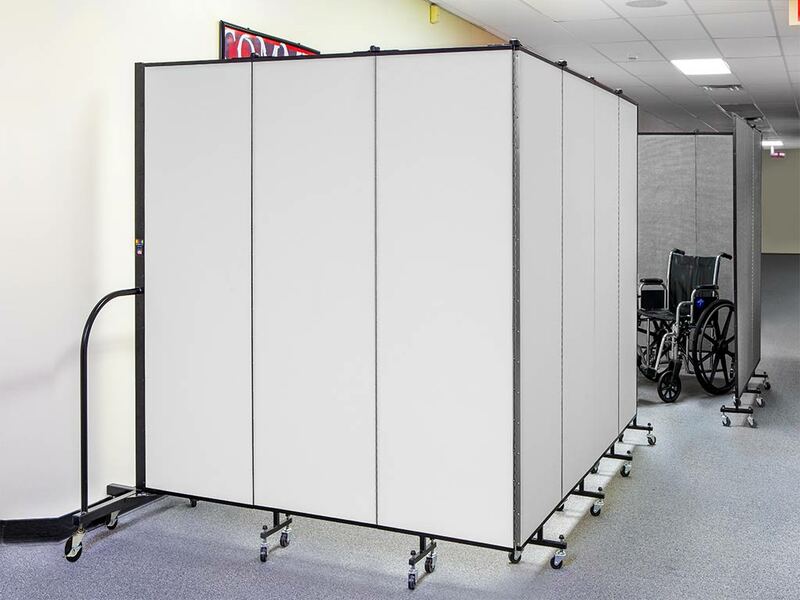 In order to meet the needs of compact spaces often found in medical facilities, our standard end frame has been removed from one end of the FlexFit divider and a unique 3-point end frame is positioned on only one side of the divider for stability. 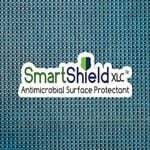 SmartShield is an EPA approved antimicrobial coating that is factory applied to any fabric Screenflex temporary partition. 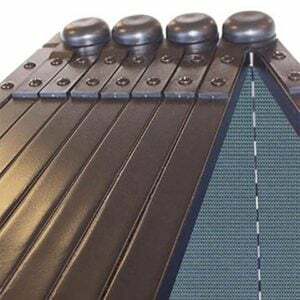 The antimicrobial coating provides an extra layer of protection against germs and allows for an overall cleaner environment. So far they work perfect for the space. We are using the dividers to separate a multi use space to look more professional. They are very easy to set up. Your company was great and very helpful! We have an Assistive Technology Room and needed part of the room carved out for storage of larger equipment so the rest of the room could be used for patient treatment. Thanks for providing such a great product. We needed to divide treatment tables for patient privacy in our new facility. 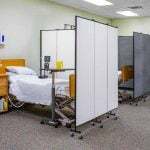 Screenflex dividers not only create private areas for the patients, but ambient noise in the room.